The Indianapolis Colts held a 24-0 lead after the first quarter in a road game versus the Houston Texans but the home team responded well to make a game out of it. Andrew Luck and the Colts held off J.J. Watts and the Texans’ rally to get the 33-28 victory on National Football League’s Thursday night game. The Houston Texans have the worst first quarter performance right now in the league. The Texans have now lost 2 games back to back and now falling to 3-3 after starting their promising season 3-1. The positive note that the Texans have waiting for them though, is that they will get Jadeveon Clowney back in a couple of weeks. Luck had 370 passing yards (25-of-44 completions) with 3 touchdowns while T.Y. Hilton had 223 receiving yards (9 catches) with 1 TD to lead the Colts to their fourth victory in six games. Houston has split the first six at 3-3. The Texans could simple not stop Hilton all night. Hilton has torched the Texans throughout his career, and he didn’t waste any time in Thursday’s game. He caught a 40-yard pass on the Colts’ first drive, then added a 49-yarder on the next series. He finished the first quarter with five receptions for 147 yards, and later scored his first touchdown of the season from 33 yards out in the third quarter. While he may need big plays to find the end zone, Hilton has proven to be much more than a deep threat in the Indianapolis offense. For Houston, Arian Foster ended up with 109 rushing yards with 2 TD and Andre Johnson added 99 receiving yards on 7 catches with 1 TD. J. J. Watt had 2 sacks and a fumble return for TD in the Texans’ failed comeback bid. That is the J.J. Watts second touchdown in two weeks. Right now he is clearly the best defensive player in the NFL and is on track to win Defensive player of the Year award. Foster looked perfectly healthy as the Texans stuck with a balanced offense despite falling behind 24-0 in the first quarter. While QB Ryan Fitzpatrick has struggled to move the ball all season, Foster has been as consistent as possible, topping 100 rushing yards in each of his four full games, with five touchdowns in an inconsistent offense. The Houston attack will continue to run through Foster and even the team’s shaky passing game doesn’t seem to be holding him back. Next week will bring a friendly matchup with the shaky Pittsburgh defense. Indianapolis led 27-14 at the half but Houston scored two touchdowns after the break to cut the lead to a single point. The Texans had a legit chance to steal the win but had key fumbles near the end of game. 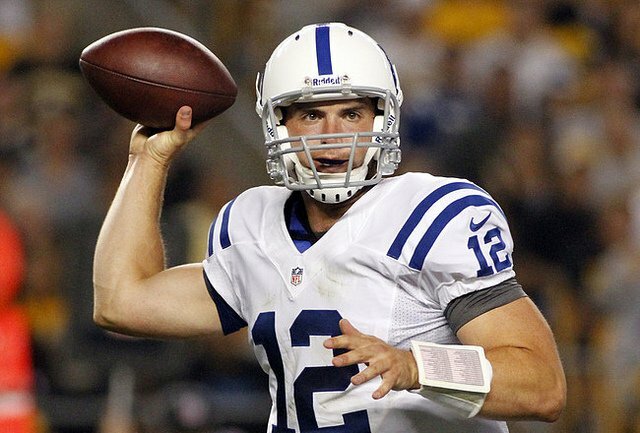 The Colts face the Cincinnati Bengals in their next game while the Texans take on the Pittsburgh Steelers.